One of the most frequently asked questions we get at Playa Nicuesa Rainforest Lodge is: â€œWhat are the meals like?â€ Given Playa Nicuesa Lodgeâ€™s remote location, this is an important question. Everyone wants to know what they are going to eat! At Playa Nicuesa Lodge, all meals and snacks are included in guest stays. 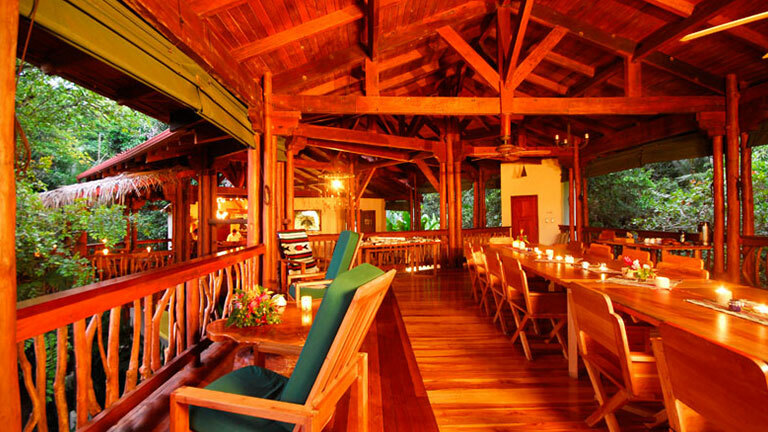 We know what youâ€™re thinking â€¦ isolated eco-lodge means spartan, simple meals, right? Wrong. Nicuesaâ€™s chefs prepare exceptional meals of world-class cuisine fresh every day. Emphasis is on healthy local Latino-style cuisine, fresh fish, tropical fruits and vegetables. On our 165-acre private reserve we grow many different tropical fruit trees, including mangoes, star fruit, oranges, lemons, papayas, water apples, bananas and coconuts. Our edible garden supplies us with pineapples, sugar cane, some vegetables and herbs. Our breads, tortillas and desserts, juices and salsas are made fresh in our kitchen, as is our signature lemongrass tea. The water at Playa Nicuesa is drinkable right from the tap. It comes from a natural spring, and we have a UV and sediment filtration system. The Golfo Dulce in front of the lodge is full of fresh fish. Take one of our fishing tours, or learn to fish with a hand-line right from our dock. What you catch may be dinner or an appetizer that night! Menus may be custom tailored to â€œchildren friendlyâ€ foods, vegetarians, and persons with specific dietary needs. We ask that you or your travel agent let us know about any dietary requirements as early as possible before your arrival. Since the lodge is remotely located, we plan all meals far in advance. See sample menus here. Dining at Nicuesa Lodge is family-style in our uniquely designed tree-top open-air dining area (or, you may dine at a separate table upon request). We always enjoy the wonderful conversations and sharing of adventures that take place between our guests. Happy hour with drink specials and appetizers is nightly between 6:00 and 7:00 p.m. in our thatched roof candlelit bar.